Whether you're looking for a classic jazz kit or small kit for gigs/rehearsals, the Catalina Club Jazz kit projects a retro sound, vibe and spirit that will keep you deeply grooving. 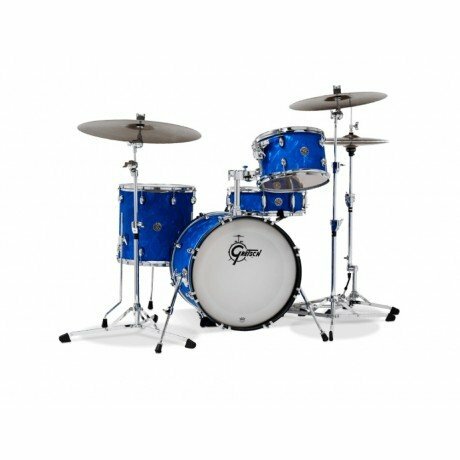 Winner of the 2018 Drummie Award for "Best Drum Set under $ 1,OOO", this Gretsch Catalina 4-Piece Jazz Shell Pack is designed for the player who is looking for a versatile 4-piece set with quality features. Featuring mahogany shells and 30º bearing edges, this set projects a warm, round, classic tone. The traditional bebop sizes with 18" bass drum makes it a fine gigging jazz kit but the Club Jazz can also play comfortably in other music styles, especially if you need to lay into a kit in a smaller live venue. Plus its distinctive retro looks are sure to capture attention. Bass drum: 18 x 14"
Rack tom: 12 x 8"
Snare drum: 14 x 5"